We had a Sweet Water 420 Ale on draft.Great little barGreat PubIt is pub food (burgers, sandwiches). All served open faced with fries. 10 and under. Served with one side. 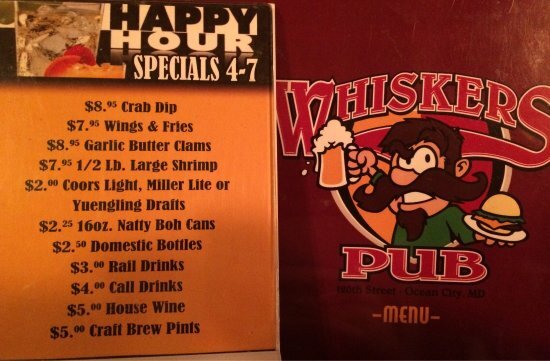 Whiskers Pub is a full service pub style restaurant serving lunch and dinner daily. Since opening in 1988, Whiskers has been a neighborhood staple in Ocean City serving locally famous burgers, cold beer, and comfort food everyday. Looking for an eastern shore crabcake?, Whiskers has them! While being locally owned and operated, Whiskers Pub uses old eastern shore recipes for all its seafood dishes. Whether its a great steak or a juicy burger Whiskers Pub is sure to please. great little pub. local beer is available. start here and then wonder! numerous eateries in same shopping center. Nothing special but food was decent, pricing low to mid range. Staff was attentive without being overbearing. Sports themed decor. Small tables, booth, and bar seating. Thats awesome. Thanks for visiting us were glad you had a great time. 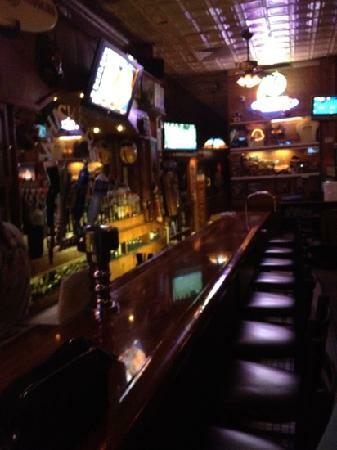 Get quick answers from Whisker's Pub staff and past visitors.